If you’d like to book a Sandals or Beaches vacation, please be sure to book with one of the agents at Bethany Travel or send us an email. If you click on the link for Sandals or Beaches and book on Sandals.com, we will get credit for your booking but cannot service the booking in any way and we pride ourselves on our excellent customer service. Please use the links as a reference, but book with us directly. Ultra All Inclusive resorts – Adults Only. All meals (fine dining) & unlimited premium brand drinks. Scuba diving and watersports included. No tipping allowed (with the exception of butler suites). 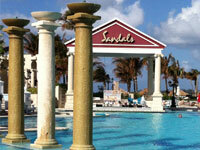 Sandals recommends the use of a Preferred Agency. 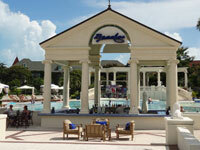 Bethany Travel is a Sandals Chairman’s Royal Club Elite Agency. Waterparks, Xbox, Sesame Street & more. Beaches recommends the use of a Preferred Agency. 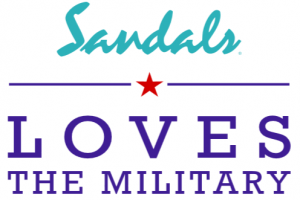 Sandals Resorts, the world’s only Luxury Included Vacation for two people in love, now offers military couples an additional 10% savings, year-round, when you book a stay at any of our 15 spectacular Sandals Resorts. Spend time with the one you love on a romantic getaway with every conceivable luxury. From specialty dining, watersports, golf and unlimited premium spirits to elegantly appointed suites, many with personal butler service, and the world-class Red Lane Spa, you’ll experience why Sandals Resorts is voted “World’s Best” year after year. Click on a resort to open a digital slide show and more information!